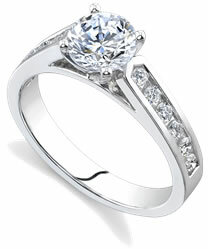 See the sparkle of a palladium diamond bridal set! If you closely observe them, the most attractive engagement rings would not be single rings but beautifully paired bridal set engagement rings. The best part of the matching bridal sets is that they integrate both an engagement rings and wedding band into one uniform design. 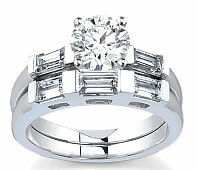 Bridal set engagement rings have become a popular alternative to traditional individual rings and have been liked by women who dislike wearing more than one ring. Furthermore, couples prefer the sets as the cost is often less than purchasing an engagement ring and wedding ring separately. On the wedding day, all the eyes would be on the bride who would be glowing with happiness. To enhance her charm and beauty, the bride must wear perfect jewelry sets that will complement each other. This can be easily achieved by buying a bridal set comprising necklaces, earrings, bangles or bracelets and of course a wedding ring. She can shop for the complete bridal set instead of separately buying each item. By this way, a lot of money can also be saved. At Novori Jewelry, there is a mesmerizing collection of matching bridal sets that come in different precious metals like gold, silver, white gold and platinum. Diamonds, emeralds, ruby and sapphire adorn the matching bridal set rings which would surely impress the bride to be. The palladium engagement bridal set with princess diamond accents, palladium diamond engraved sets, and white gold diamond engagement pave bridal sets available at Novori would surely take your breath away. Novori also features French Pave rings. The choice of the bridal set however depends on one’s taste and affordability. 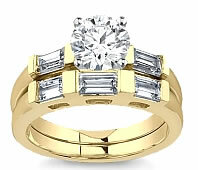 Basically there are two types of bridal set engagement rings; parallel rings and integrated rings . As the name suggests, parallel rings are separate rings and either ring can be worn by itself. 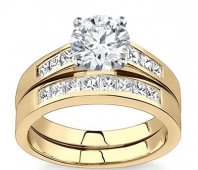 Usually in a parallel set the wedding band typically does not have raised stones or other elaborate details. On the other hand, in an integrated bridal set, there would be more elaborate design pairs. Since the bridal sets are imaginatively put together and meant to be worn together, Novori Jewelry offer an exquisite range of integrated rings in brilliant crafted diamonds. The bride to be must browse through our engagement ring set collection and select a ring that would match her wedding gown and other accessories. The wedding set will look fabulous if it blends perfectly with the bride’s attire.